For almost six months in a row, my daughter’s nightly bedtime routine started with her climbing onto my lap and handing me her favorite book. Before we even flipped it open, she and I would repeat this phrase: “Elmo is ready to learn the Animal Alphabet.” Elmo would then lead us through a branded menagerie of fauna until we ended up on Zebra. And then we’d read it again. “Sesame Street’s Animal Alphabet” is one of five different animal-themed ABC books my daughter has in her tiny bookshelf, and over repeated readings of each, I’ve became painfully aware that they share many similarities. I’ve seen maybe one yak in my life, yet I yak about them night after night. 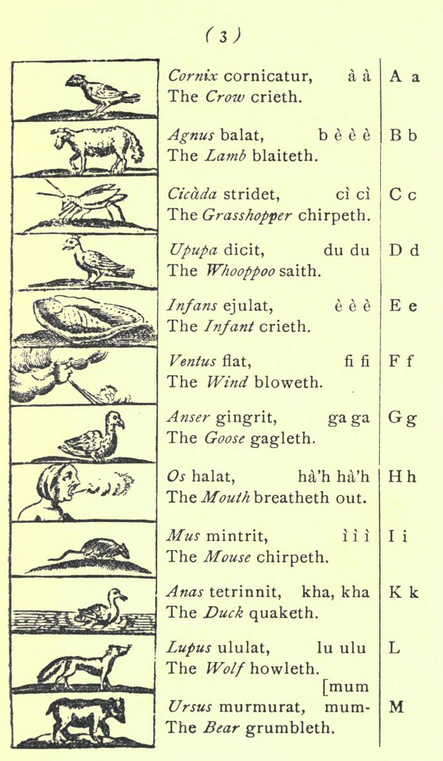 If I were an 18th-century European school teacher, I might have read phrases like “The Duck quacketh. The Wolf howleth. The Bear grumbleth” to my young students. They come from one of the first illustrated children’s books ever created: “Orbis Sensualium Pictus,” the most popular textbook of the time. It’s no coincidence that it was also an animal ABC book. “Orbis Pictus” was the brainchild of John Amos Comenius, a Czech bishop widely regarded as the father of modern education. In addition to developing a kindergarten-to-university schooling timeline that’s still used around the world today, he also was one of the first to espouse a philosophy of connecting childhood education — and literacy in particular — to the environment to make it more fun and its lessons easier to grasp. Over the last 150 years, Comenius’s philosophy has come to dominate, and playful ABC books have become a genre unto themselves. There are currently almost 1,400 alphabet books for sale on Amazon’s U.S. site, about half of which, based on my estimation, use animals to represent their letters. Many famous children’s authors have taken a crack at penning an animal alphabet book (Dr. Seuss, Sandra Boynton, Eric Carle), and several major kids’ brands have their own animal ABC books, too (Hi, “Barney,” “Sesame Street” and “Baby Einstein”). Our collected animal abecedaria represent a view of nature that we want to share with children. They’re a proxy for the act of reading itself — we want the animals in the books to be natural and fun and engaging in order to entice children into the early steps of literacy. Which animals occur most often, then, are a glimpse into what we think might get kids to pick up a book and stay a while. To get a sense and take a census, I analyzed 50 animal ABC books ranging in publication date from 1820 to 2013. They weren’t individually selected, but were simply the ones available to me: The older books were sourced online through OpenLibrary.org; the more recent ones were found in the San Francisco Public Library. (I couldn’t convince FiveThirtyEight to give me an Amazon card to buy the thousand or so I missed; we’ll have to go with a representative sampling, instead. )1 There were 1,300 data points (50 books multiplied by 26 letters) in all. What I found was a whole lot of zebras. The letter X starts even fewer words than the letter Z does, and there’s no similarly charismatic, Zebra-like animal for authors to rely on. In fact, there’s only one animal — the X-ray fish (or X-ray tetra) — that can plausibly be considered a common animal (though it’s more often referred to as the golden pristella tetra). If you’re writing an ABC book and want to be one of the 86 percent who avoid referencing obscure aquarium species, you’re stuck with finding cool animals’ scientific names (the swordfish becomes Xiphias and the armadillo becomes Xenurus), or lamely trotting out a fox or an ox and pointing out its last letter. A plurality of X’s in our data set (34 percent) — along with a significant smattering of U’s, V’s, N’s and J’s — were left blank or skipped by authors, perhaps because they thought that the absence of an animal was better than whatever they could come up with. Our alphabetical bestiary only contains four books made before 1900, but in that small sample some differences with our modern presentation of animals become clear. Most obviously, authors back then seem to have been focussed on ungulates. Bulls win out over bears, asses over alligators, ibexes over iguanas, nylghau (an Indian antelope now know as nilgai) over nightingales. Two now-extinct hoofers also dominate their respective first letters: uruses (a wild cattle ancestor) and quaggas (a zebra subspecies). 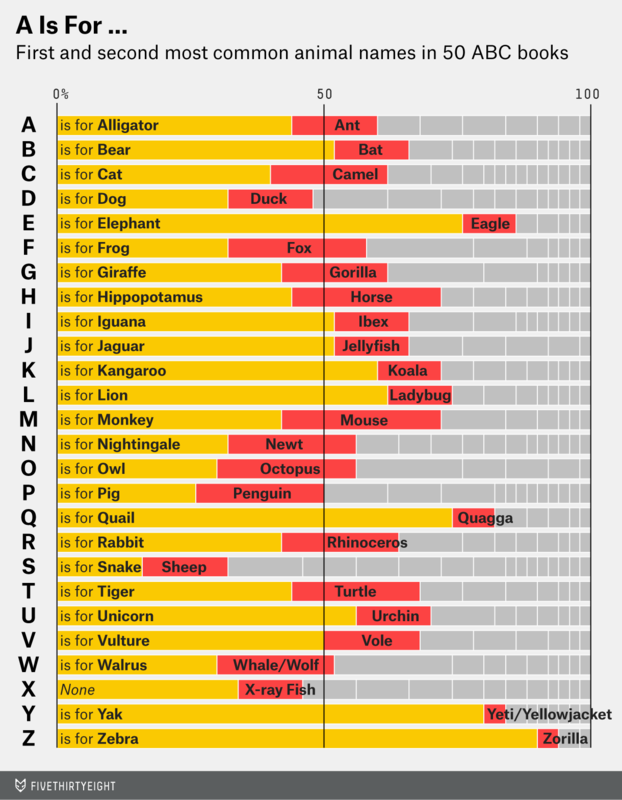 On average, each letter is represented by the same animal about half the time. (Half of the books have vulture V’s for example.) But S is different. No single animal establishes anything like supremacy, as sheep, snakes and snails all hover around 15 percent. What S lacks in clarity, though, it makes up in depth. In total, 17 different animals make an appearance on S pages, more than for any other letter. CLARIFICATION (Oct. 7, 11:23 a.m.): This article has been updated to clarify that the analysis differentiates between mainstream fictional animals (for example, unicorns) and animals seemingly made up in the writing of a certain book (for example, xylophonosauruses). If multiple animals were represented by a letter, I chose the first one mentioned or the picture most to the left of the page. If no animal was represented by a letter, I coded it as “none”; I did the same if the letter represented an animal seemingly made up by the author (like the “Xylophonasaurus”) or a non-animal (in 1980’s “My Animal ABC,” “I” is represented, distressingly, by “Indian”).